Be patient and wait, MCPE 1.10 is almost here. And so that the wait was not so unbearable, Santigamer836 created a campfire that is a planned feature of the next update. 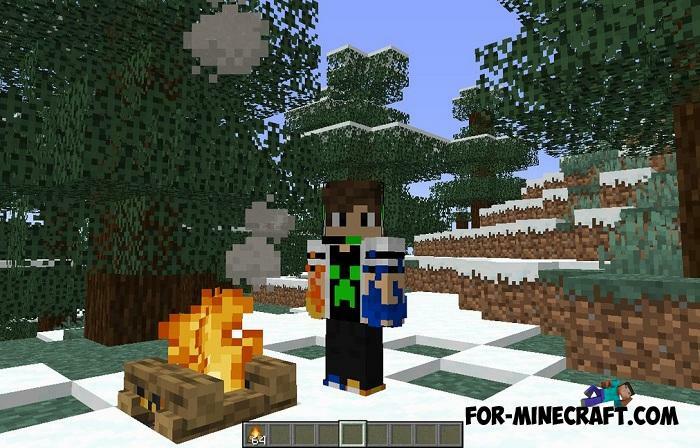 In Minecraft Java, campfires were implemented in recent snapshots and to keep up with Bedrock, Mojang will add them to MCBE 1.10. It is important to know that this is only an idea of how campfires will work and function in the game. This does not mean complete copying of the model and properties, although this version of the campfire is fairly true and accurate. How to make and put out the campfire? First you need to spawn it, it is not a separate item, but an entity implemented on addon capabilities. Then you need a lighter which instantly kindles campfire to the desired state. 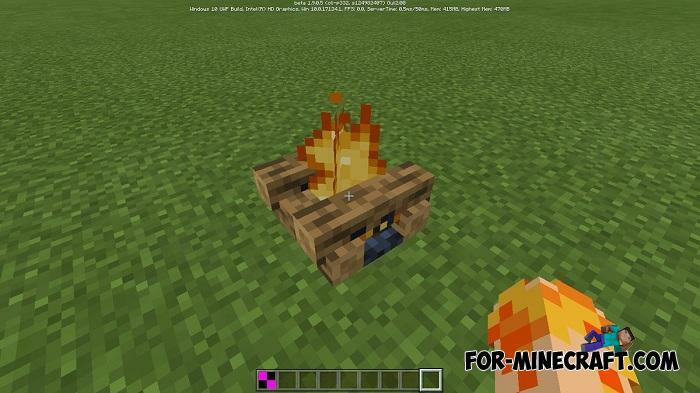 In Minecraft PE 1.10, campfires can roast meat and illuminate the nearest square. Fire is extinguished using water. Pick up a bucket of water and pour it over the fire to destroy it. In fact, bonfires will become only a small part of the planned Village and Pillage update. Find out more by clicking on the link - Minecraft PE 1.10 - A Little About. How to install the Campfire Addon?